NARF continues to fight for the Native nations who have spent years working to protect their sacred, ancestral lands and the millions of people who declared their support for our national monuments. We will not allow the rights of our Native nations and our local people to be willfully pushed to the side for the benefit of corporate interests. We will stand firm for justice. Donate now to help protect Bears Ears National Monument. After the Tribes sued to undo the President’s plainly illegal action, the defendants moved to dismiss the case on nearly every ground available. But their motion to dismiss does not stand up to scrutiny. Of course the Tribes, who have lost protection of their cultural heritage and their vested right to manage the monument lands, have standing to right those wrongs and bring this suit. On November 15, 2018, the Tribes, including NARF’s clients the Hopi Tribe, Ute Mountain Ute Tribe, and Zuni Pueblo, filed a response explaining why the government’s motion to dismiss was invalid. Of course, the real issue of the case is whether the President had the authority to do what he did. He clearly did not. On the contrary, in revoking the Bears Ears Monument and replacing it with two remnants, President Trump assumed a power that Congress repeatedly has claimed for itself. Congress did not authorize the President to revoke national monuments or remove lands from them in the Antiquities Act or any time since. NARF and the Tribes will continue to fight this presidential overreach and stand firm to protect these lands that are so tremendously significant to the people who have lived on and around them since time immemorial. Federal Judge Tanya S. Chutkan ruled on Monday, September 24, that the cases filed against the Trump Administration’s revoke and replacement of the Bears Ears and Grand Staircase-Escalante National Monuments will remain in the U.S. District Court for the District of Columbia—where they were filed—and that the Department of the Interior must alert the tribes at least 48 hours before they allow any ground disturbing activities on the disputed lands. Although the president does not have any authority to revoke or modify a monument, that is exactly what President Trump has attempted at Bears Ears National Monument. Removing protections for these lands affects all Americans, but significantly affects the five tribes (Navajo Nation, Hopi Tribe, Ute Indian Tribe, Ute Mountain Ute Tribe, and Pueblo of Zuni) in the region who consider the area sacred and have long-standing and ongoing connections to the land in question. With the issue of venue decided, this significant case can move forward; Chutkan’s order calls for the parties to begin briefing in early October. The Native American Rights Fund, representing the Hopi Tribe, Pueblo of Zuni, and Ute Mountain Ute Tribe filed a lawsuit on December 4, 2017, to protect Bears Ears National Monument from President Trump’s illegal attempt to revoke and replace monument’s protections. That suit is paused while we wait for the judge to decide in which court it will be heard. However, actions that threaten these sacred lands continue. Despite the fact that Trump’s action is in violation of the separation of powers enshrined in our Constitution and currently under scrutiny by the courts, the Trump administration is rushing through the planning stages for the illegal monument changes. The sooner that the new boundaries are established, the sooner that mining can begin. At the same time, at the request of two uranium-mining companies, the U.S. Department of Commerce is considering asking President Trump to impose uranium mining quotas. In a saturated uranium market where we already have enough uranium to meet defense needs through 2060 and low demand has led to low prices, the quotas would artificially boost prices and create much greater interest in mining on public lands. With mining claims already in place on the lands protected by the original Bears Ears National Monument, a uranium quota and subsequent higher prices could have a direct effect. Artificially inflated prices would make these mining claims more valuable. The effect on utilities with nuclear plants, which would be affected by higher prices and could drive up the cost of electricity. The low demand for uranium and stockpiles that already are in place in the United States. The adverse environmental and economic impact of increased uranium mining on local economies and tourism. Thank you for taking action to protect our public lands and a region that is so essentially important to Indian Country against a blatantly attempt by uranium suppliers to increase their profits. 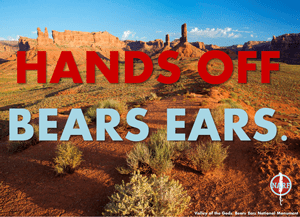 At the end of January, the courts consolidated the three cases dealing with the Bears Ears monument in to one case and consolidated the two cases addressing Grand Staircase-Escalante in to a separate case. The judge has given the government until March 16, 2018, to file a response to the original complaints. The lawsuit may take a while to litigate, so NARF continues to monitor activity on the ground to ensure that there is no irreparable harm to this important place. If there is any activity that would cause harm, we will ask the court to put a stop to it. On January 16, federal agencies initiated a public comment process on the issues related to the environmental analysis and planning criteria for the revised monument boundaries. The public comment period will be open until at least March 19, 2018. In legislation, bills were introduced in Congress to shrink and replace Bears Ears, codifying President Trump’s actions, as well as to expand Bears Ears. The Tribes are unified in support of the bills that would expand Bears Ears, and they unanimously oppose the bills that would shrink and replace Bears Ears. Tribal representatives have commented on legislation currently under consideration in Congress. Five tribes—Hopi Tribe, Navajo Nation, Pueblo of Zuni, Ute Indian Tribe, and Ute Mountain Ute Tribe—led the effort to establish the Bears Ears National Monument, an area still used for cultural and religious purposes. Increased looting of the estimated 100,000 plus structures, sites, and objects within every reach of the monument dictated the need for protections in the form of a monument designation. This latest action follows on the heels of the Administration’s other actions against Tribes: (1) issuing the permit to the Dakota Access Pipeline, (2) issuing the permit to the Keystone XL, and (3) revoking the Executive Order to protect the Bering Sea on April 28th. Tribes vigorously opposed all of these efforts. The Administration uses the term “tribal sovereignty” but clearly does not understand what that means. Bears Ears at Sunset. Photo credit: Tim Peterson. Bears Ears has been home to Native peoples since time immemorial, and is cherished by Native peoples for its cultural, spiritual, and archaeological importance. Our presence, much in evidence today, covered the whole region and is manifested in migration routes, ancient roads, great houses, villages, granaries, hogans, wickiups, sweat lodges, corrals, petroglyphs and pictographs, tipi rings, and shade houses. Bears Ears contains hundreds of thousands of objects of historic and scientific importance, many traditional cultural properties, and many sacred sites. Tribes in the region continue to use the Bears Ears region to collect plants, minerals, objects, and water for religious and cultural ceremonies and medicinal purposes. 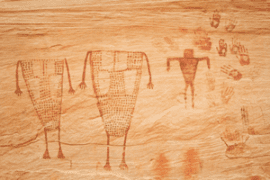 Native people hunt, fish, and gather within Bears Ears, and they provide offerings and conduct ceremonies on the land. In fact, Bears Ears is so culturally and spiritually significant that some ceremonies use items that can only be harvested from Bears Ears. Bears Ears is in every way a home to the region’s Native people. Sadly, as they began planning to protect this landscape to which they hold such a deep connection, many Native Americans in the area also expressed a fear that speaking out about the significance of the land would lead to another loss – something else taken away from Native people. However, doing nothing was not an option. Looting, vandalism, and development were well underway. The desecration of these lands already was happening. Something had to be done to protect what was left. 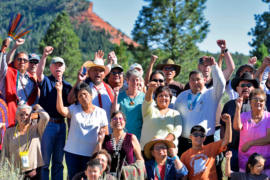 In 2010, the grassroots nonprofit organization, Utah Diné Bikéyah (UDB) was formed to help coordinate the Bears Ears Proposal, which sought protections for the Bears Ears region. UDB spent the next several years developing a comprehensive cultural mapping of the area. Using that information, detailed maps were prepared to show why 1.9 million acres should be set aside as a cultural landscape. Their work showed that the Bears Ears landscape is one discrete unit, bound together in numerous ways, and blending perfectly with other protected federal and tribal lands. Around the same time, more tribes in the region began to express their support the Bears Ears Proposal. The Hopi sent a letter of support, the Ute Mountain Ute Tribe, the Ute Indian Tribe, the Hualapai Tribal Council, the Pueblo Council of Governors, and others expressed support for the Bears Ears Proposal and the protection of the sacred landscape. And, in late 2014, after a series of town hall meetings and open houses, the Bears Ears proposal won 64% of support from San Juan County residents. The San Juan County Commissioners, however, chose to adopt an alternative proposal that received less than 1% of support. In January 2015, the San Juan County commissioners refused to work with UDB. So, tribal representatives contacted Utah Congressmen Bishop and Chafetz, explained their exclusion, and requested to be included in Representative Bishop’s ongoing Public Land Initiative. Subsequently, in February, the San Juan County Commissioners did agree to a series of meeting with the Navajo Nation, Ute Mountain Ute Tribe, and UDB. However, only one month later, the San Juan Commissioners urged the Utah State Legislature to pass HB 3931, which undermined the Bears Ears proposal by designating large areas of the region as “Energy Zones” that would be fast-tracked for grazing, energy, and mineral development. Although the meetings between the county and Tribes did continue, they did not produce any results. And, for the final meeting, tribal representatives were told that they did not need to attend because the county commissioners did not require any further information from them. A final proposal was adopted by the county commissioners in August 2015, without input from the Tribes. 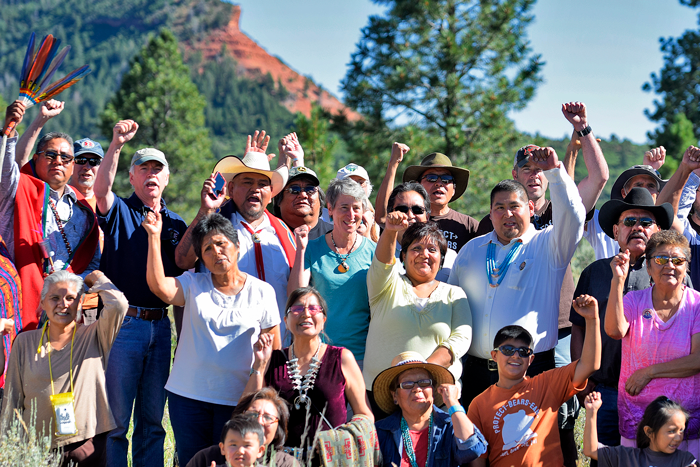 Having been completely frozen out of the local land management process, the Hopi Tribe, Navajo Nation, Ute Mountain Ute Tribe, Pueblo of Zuni, and Ute Indian Tribe, formally united to create the historic Bears Ears Inter-Tribal Coalition to protect and preserve the homeland area they all care so deeply about. 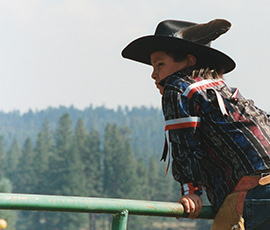 This was the first time that a coalition of sovereign, Native tribes had worked together for land protections. The Coalition proposed a National Monument designation for 1.9 million acres of ancestral land. With more than 100,000 archaeological sites, 1.9 million acres of land, and only one full-time law enforcement officer, the area represented the country’s most significant unprotected cultural landscape. Bears Ears Gathering, Summer 2016. In January 2016, Congressman Bishop released his Public Land Initiative (PLI) that included protection for 1.39 million acres of Bears Ears. While it did include land protections, it did not include tribal management of the area, which was a key tenet of the tribe’s Bears Ears Proposal. The Bears Ears Inter-Tribal Coalition did not support the PLI for several reasons, but one of the reasons was that the PLI Bill would have taken Ute tribal land and given it to the state of Utah. The Bears Ears Inter-Tribal Coalition continued to petition for their Bears Ears Proposal, and, in July 2016, federal officials, including Secretary of Interior Sally Jewell, met with Utah Governor Herbert’s office and made an official visit to the Bears Ears region. During that visit, Jewell attended a public meeting to hear comments from local residents. At that meeting, thousands of people attended, and more than 50 people commented. A majority of attendees spoke in favor of the Bears Ears designation. In December 2016, Congress adjourned without voting on Bishop’s PLI. With this lack of legislative action, President Obama released his Bears Ears National Monument proclamation on December 28, 2016. The form of Obama’s monument was a compromise between Bishop’s Public Land Initiative and the Coalition’s Bears Ears Proposal. At 1.35 million acres, the monument’s boundaries were closely aligned to those of the PLI, but the proclamation also included a management plan that empowered tribal leaders to provide guidance and recommendations on care of their ancestral lands. The designation was the culmination of local activism, coordinated outreach, and collaborative land-use management. Pictographs. Photo credit: Jonathan Bailey. President Obama proclaimed the Monument pursuant to his authority under the Antiquities Act, just as all presidents since Theodore Roosevelt had established national monuments. It was the culmination of more than six years of active effort on the part of five Native nations, local tribal people, and their allies to obtain protections for a region that is a sacred source of spiritual traditions and place of origin. On April 26, 2017, President Trump attacked this important designation. Trump signed an executive order directing Interior Secretary Ryan Zinke to conduct a review of the Bears Ears National Monument to determine if it was created without “public outreach and proper coordination.” However, the suggestion that the monument’s designation lacked outreach and coordination is disingenuous. The Bears Ears National Monument was created after years of advocacy and many public meetings in the region and in Washington, DC. The effort to protect Bears Ears was very long, very public, and very robust. That lengthy process over many years, sits in stark contrast to Secretary Zinke’s cursory 3-month review that introduced no new facts or analysis and completely ignored public sentiment. On August 24, 2017, Zinke submitted to the White House recommendations to shrink monuments, including Bears Ears. Despite Zinke’s claim to be giving the people their voice back, his recommendation to shrink the monuments ignored an outpouring of public support for Bears Ears and other monuments. More than 95% of comments received by the Department of the Interior supported keeping the national monuments, including 65% of comments from Utah residents. It did not matter. The only voices that were heard were those calling for increased development, increased exploitation, and reduced protections for a national treasure. Now, President Trump sits with Zinke’s recommendations in hand. However, the recommendations are pointless. Although Trump has stated that he will shrink the Monument, he does not have the authority to take such action. Under the Antiquities Act, the president may create national monuments. That is all. He or she may not diminish or revoke existing monuments—only Congress has that ability. Beginning with Theodore Roosevelt, Presidents have designated more than one hundred monuments throughout our country. No President has ever previously sought to abolish one by Executive Order because the Antiquities Act does not authorize the President to do so. If this unprecedented and unlawful action is allowed, the 129 national monuments across the United States will be at risk. The historic and cherished national monument system will be destabilized. Congress clearly did not intend for that result. It enacted the Antiquities Act to preserve America’s historic and scientific heritage for the benefit of current and future generations. Congress reserved to itself the authority to revoke or modify those monuments, and granted the President only the power to create them. The Native American Rights Fund (NARF) stands ready to defend that legal reality. NARF represents three of the five tribes in the Inter-Tribal Coalition—the Hopi Tribe, Pueblo of Zuni, and Ute Mountain Ute Tribe. Currently, members of Congress are trying to push through legislation to give the President the authority he seeks, ignoring standard legislative procedure as they maneuver bills through without comment or debate. If the diminishment or abolishment of the Bears Ears National Monument is allowed to proceed, the Bears Ears area will be subject to the devastating damage of oil and gas drilling, uranium and potash mining, mineral exploration, uncontrolled off-road vehicle use, widespread vandalism and looting, and grave robbing. Furthermore, invaluable archaeological, paleontological, and faunal information will be lost to science and history.